Secondary students benefitted from a very informative talk from Mr. Francisco Torres (faculty of Philisophy), about various courses available for them in University of Alicante. They also learned about the admission process. It was a very useful session. 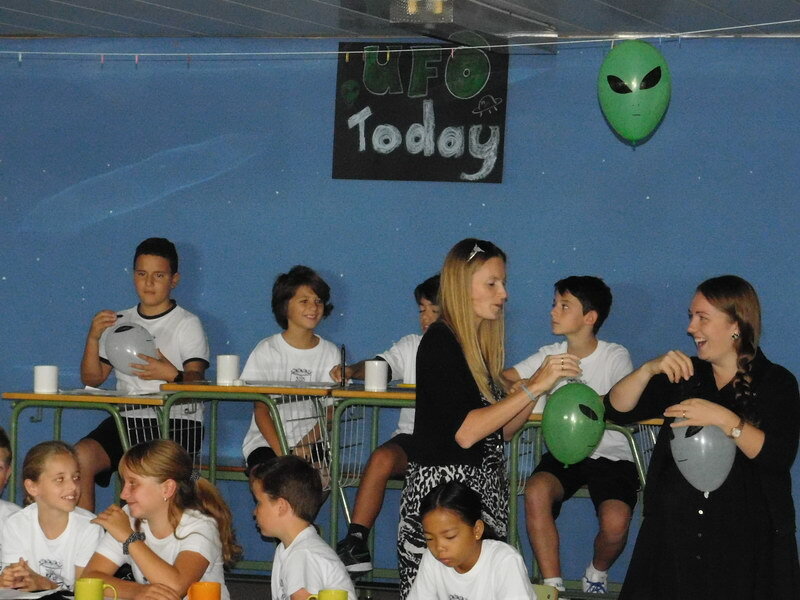 Our students wish to thank the school and the Alicante University for this opportunity. Year 3/4 have been learning about forces. We carried out an experiment to see how different surfaces affect the force of an object. On Friday 4th December, our Key Stage 2 classes went to the Lighthouse in Albir. The tour had several objectives, in addition to walking and enjoy the surroundings we saw and experienced some of the concepts we have studied in our natural sciences lessons. During the walk to the lighthouse, we could see the different landscapes and the elements that compose it. We analysed the different temperatures of objects using a digital thermometer, listened to the pleasant sounds that nature offers us and made our own echoes! We also enjoyed the landscape through different types of lenses: binoculars, cameras and glasses. It was a fun trip and everyone had a great time! 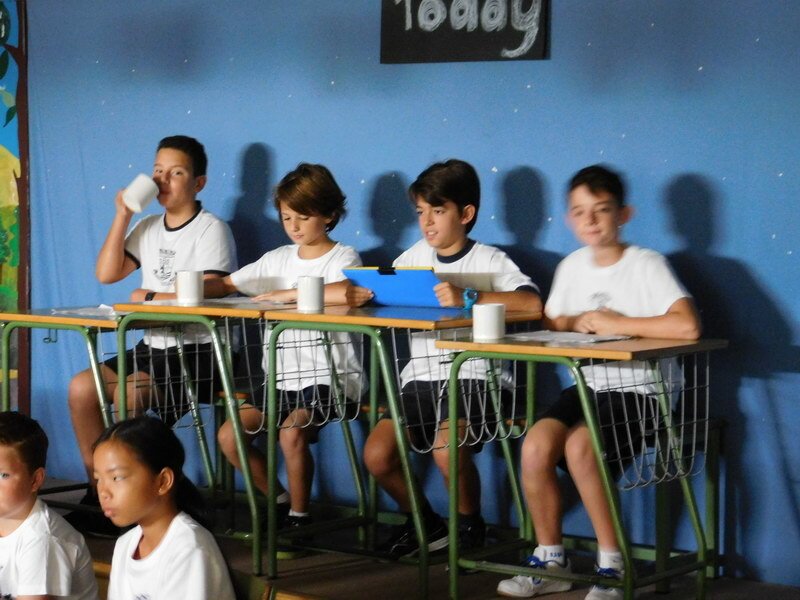 El viernes día 4 las clases de primaria de nuestro colegio fuimos al Faro del Albir. La excursión tenía varios objetivos, además de caminar y disfrutar del entorno, ver y experimentar conceptos que hemos estudiado en la asignatura de ciencias naturales. Durante el paseo hasta el faro pudimos ver los diferentes paisajes y los elementos que lo componen, experimentar las diferentes temperaturas de los objetos utilizando un termómetro digital, comprobar los sonidos agradables que nos ofrece la naturaleza y el eco, así como, contemplar el paisaje con diferentes tipos de lentes (binoculares, cámaras y gafas). Fue una excursión muy divertida donde todos lo pasamos muy bien. Last week our secondary Key Stage 4 Geography students enjoyed a day out at the beach. They undertook fieldwork investigations into coastal processes at Playa Albir. This was a key part of gaining important skills in their studies of Coastal Environments. 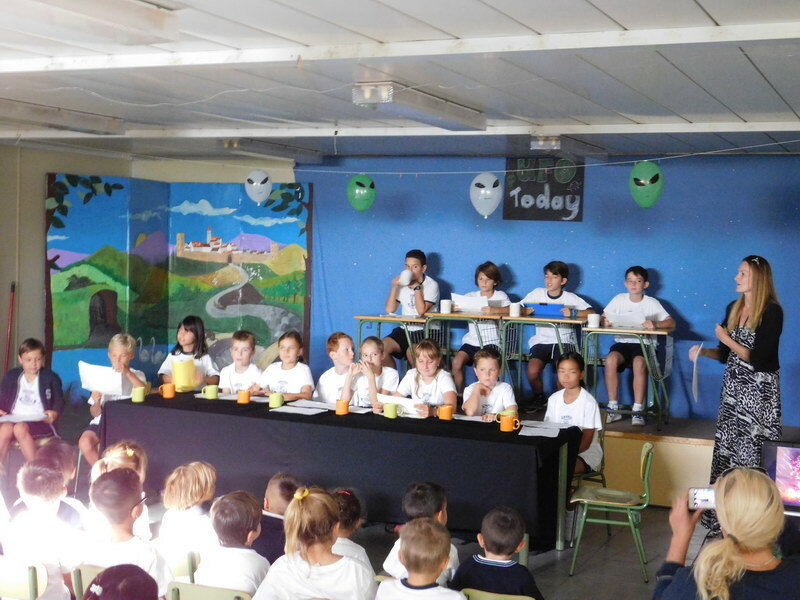 Los alumnos y alumnas de Lower Primary presentaron en su asamblea de esta semana una recopilación de juegos tradicionales. Han estado estudiando en la asignatura de lengua castellana las cantinelas y retahílas infantiles populares utilizadas en los juegos. Los chicos y chicas utilizaron las clásicas retahílas para echar a suertes, cantaron diversas canciones para jugar al corro e incluso se atrevieron con juegos de saltar a la comba. Fue un excelente comienzo de viernes que hizo recordar agradables momentos de la infancia a los padres, profesores y todos los asistentes. Our secondary Key Stage 3 students participated in the demonstration of how to make a French quiche. Miss Sara, our French teacher, made a yummy quiche in our food technology lesson. 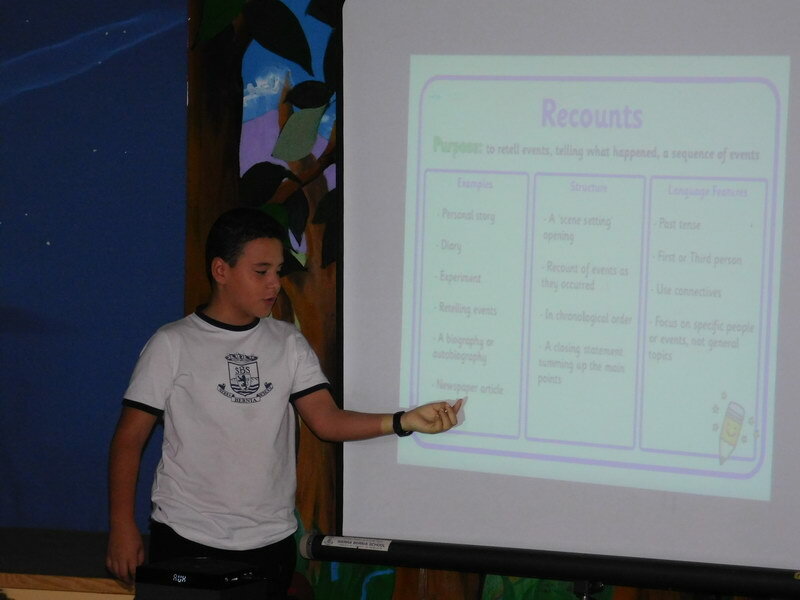 The students were very entertaining enthusiastic and enjoyed the lesson. Year 3/4 investigated how tribes built their homes. We thought it would be easy so planned and designed our own rainforest homes, then tried to build them… It wasn’t as easy as it looked! Year 3/4 got to taste some of the foods that grow naturally in the rainforest. They tried avocado, mango, oranges, pineapple and Aubergine. Our favourite was the pineapple! Fruit and vegetable carving – UKS3 Food technology. UKS3 had an amazing time in their food technology lesson on Tuesday, 13th October 2015. Mrs Sarika Sukhwani, came in to show some awesome demonstrations of fruit and vegetable carving. A peacock from watermelon, a cucumber palm tree, a melon barbecue, fruit basket and last but not the least a fruit pizza. It was a fruitful afternoon, which ended up having all secondary join in to have the feast of fruits. Last week the Upper Primary class learned about how the Aztec god kulkulkan, also known as Quetzalcoatl, gave the gift of the cocoa tree to the Toltec people so they could enjoy chocolate, the drink if the Gods. So this week it only seemed fair that they visit the Valor factory in Vilajoyosa, to see how chocolate made the journey from Mexico to Europe and how it is made into the many chocolate treats we enjoy today. It was a great day out and the children enjoyed a short journey on the TRAM before heading down to the beach to collect some shells for Mrs Vaughan’s art project. Then the fun began! The children savoured the aroma of molten chocolate before indulging in trays of FREE CHOCOLATE!!! Gifts were bought for mums and dads and absent class mates, before they caught the TRAM back to school. Learning about chocolate sure is hard work, but someone has to do it! As a part of the food technology programme for lower Key Stage 3, the students worked on the “5 a day” theme this month. They learned about the importance of fruits. Along with the theory work, as part of their practical experiences, they participated in a smoothie making competition. They worked in two teams, “Shiny Paradise” and ” Berry Minions”. They were able to make up two glamorous looking yummy smoothies. Mr Fernando, the judge, decided that Shiny Paradise were the winners for the taste, while Berry Minions won for the presentation. 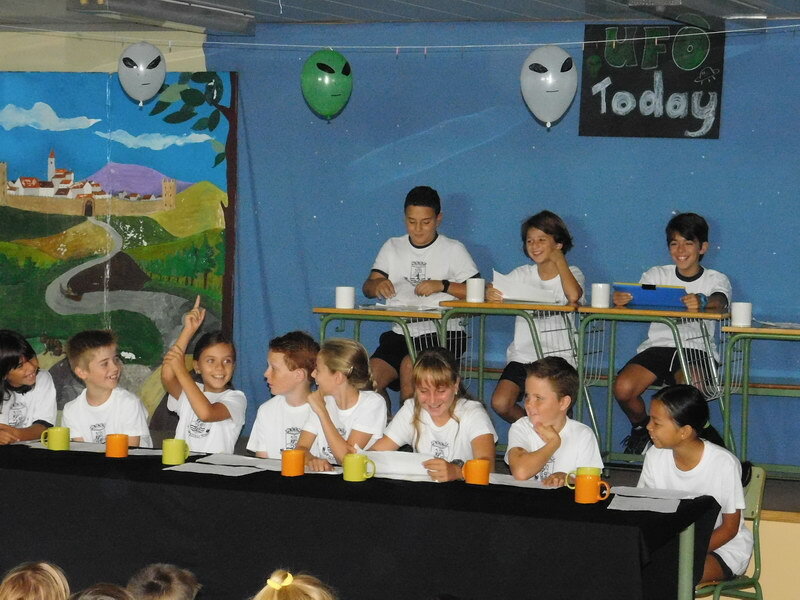 The Upper Primary class presented an alien invasion in their assembly this week through recount texts and graphics manipulation. 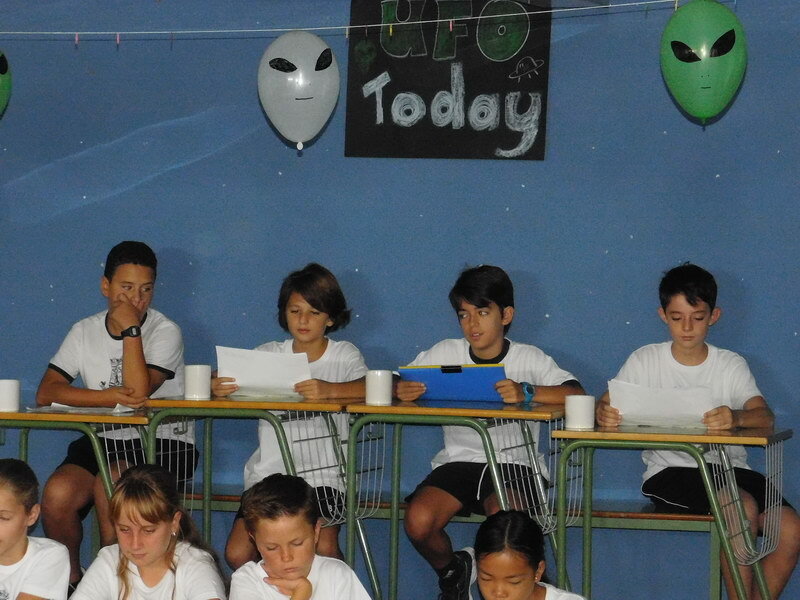 Despite the very different levels of English in the class, every child participated by reading out alien diary entries or being interviewed about their own alien encounters. 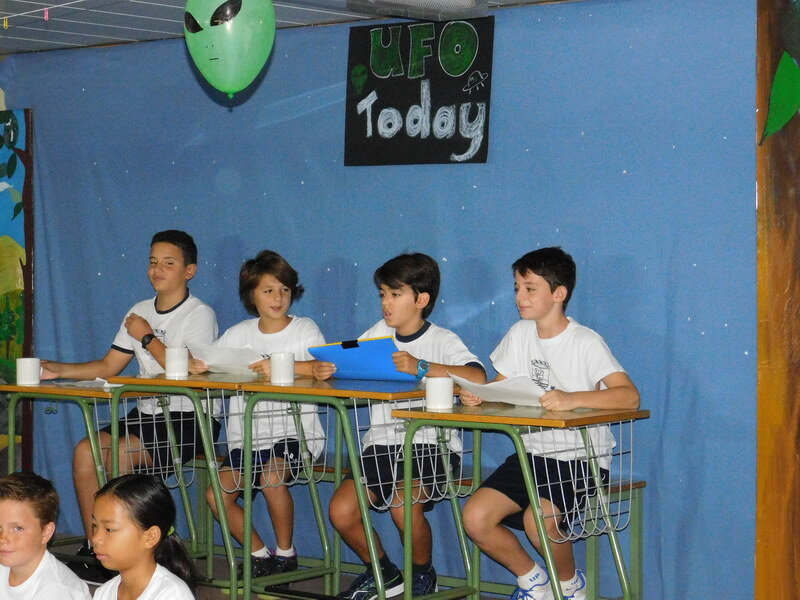 In their ICT lessons, the children had produced their own UFO hoax photographs which they presented as the news of a local alien invasion broke, before a short video clip of the children running from an advancing superior being! 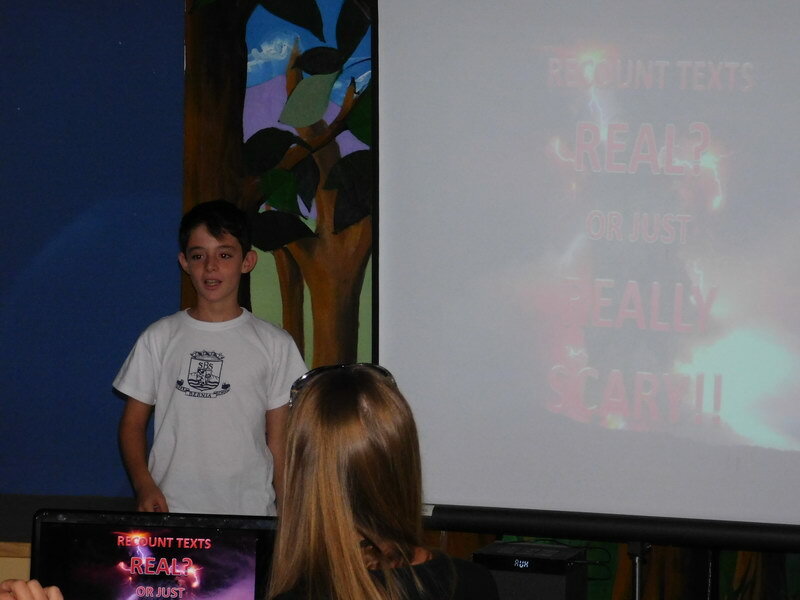 Well done to the whole class for putting tons of effort into their assembly, but special thanks go to this week’s star of the week, Fernando, who’s ICT know how made the special effects of the assembly possible. Thank you Fernando and keep your eyes on the skies! This term Year 2 are studying sculpture in Art class. Today we visited Fundación Klein Schreuder, where we saw many beautiful sculptures. It was a perfect way to start Friday. The children returned to school talking about which pieces os sculpture they like best. We took lost of photos to remind us of amazing time there. Our assembly being the first “teacher assembly” of the academic year, we as a team (my tutor group Upper Key Stage 3 and me) decided to do an assembly on “Getting organised”. Organisational skill is a superpower n the key to success. It is a value to inculcate for steady progress. 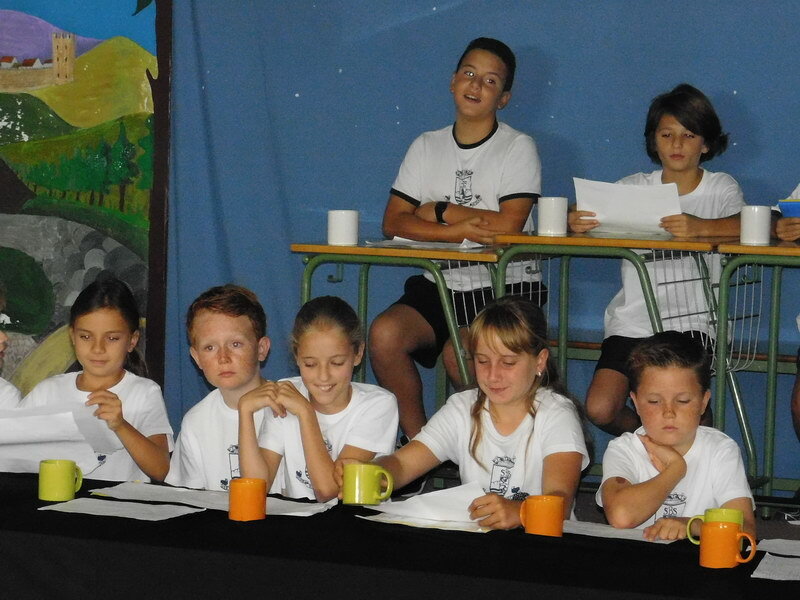 The students enacted a small play which showed how “being disorganised” makes you look. Followed by a small power point presentation of your check list to make you more organised. The assembly received a good response from the audience. In our Science Topic “Fighting Fit”, Year 2 are studying “Making things better”. A long time ago people used to make medicine from herbs and other plants. Today, we made mint tea using leaves from the mint plant. In the past people would drink mint tea to settle their stomachs. 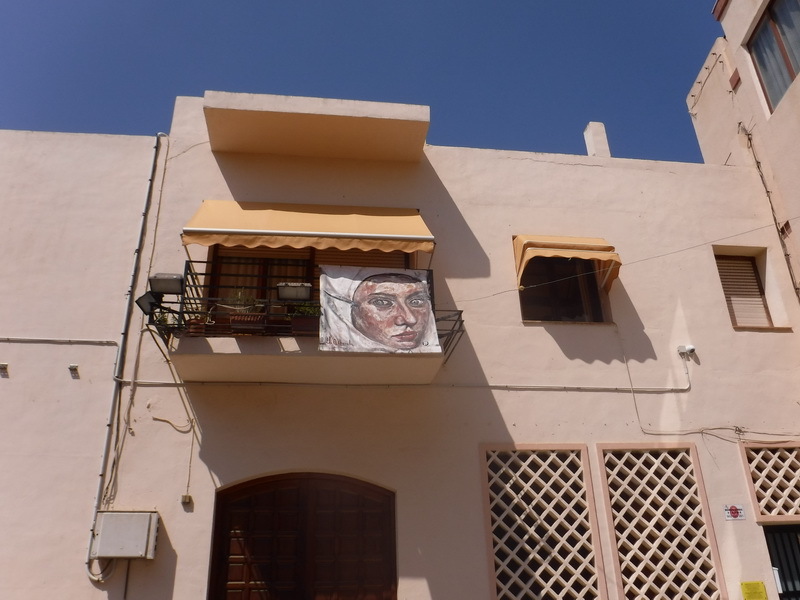 This week Year 2 took a trip around Alfaz del Pi to see “Les Balconades”. There were 61 works of art to see and the children photographed their favourites so they could recreate them when they got back to school. Last friday, two ASOBAL players (premier handball competition) from Club Balonmano Benidorm, Danil Chernov and Miguel Llorens, came to our school to explain the importance of persistance, healthy habits and studying, in professional sport. After that, they showed our pupils how to play handball and invited them to be present at next important C.Bm.Benidorm’s match on tuesday 24th. Thank you for coming and our best wishes in competition! Congratulations to Miss Lidia who gave birth to a beautiful baby boy at the end of January. Arian and his mummy are doing very well and we look forward to seeing the new family soon. Well done Miss Lidia! 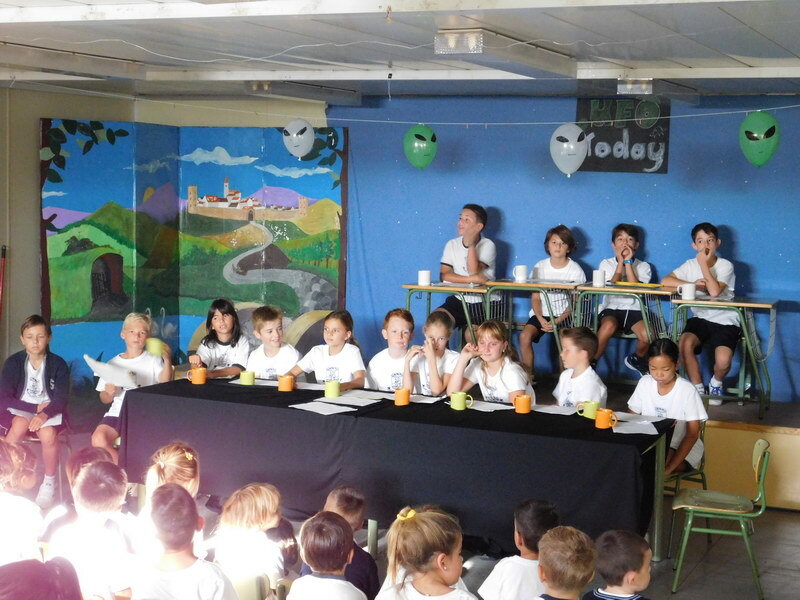 En la asamblea de esta semana que realizaron los alumnos de Upper Primary nos recordaron algunas de las normas gramaticales y ortográficas que han estado estudiando durante las últimas semanas en las clase de lengua castellana. Con ejemplos y posteriormente con preguntas nos explicaron qué son los determinantes demostrativos. A ritmo de canción nos mostraron que también se pueden aprender las normas de la acentuación de forma divertida y para terminar la asamblea interpretaron una divertida comedia en la que las “malvadas” redes sociales se iban llevando letras y signos de puntuación de una conversación y tenía que intervenir la ortopolicía para recordarnos con un claro mensaje que debemos respetar y cuidar nuestra ortografía cuando hagamos uso de las redes sociales. 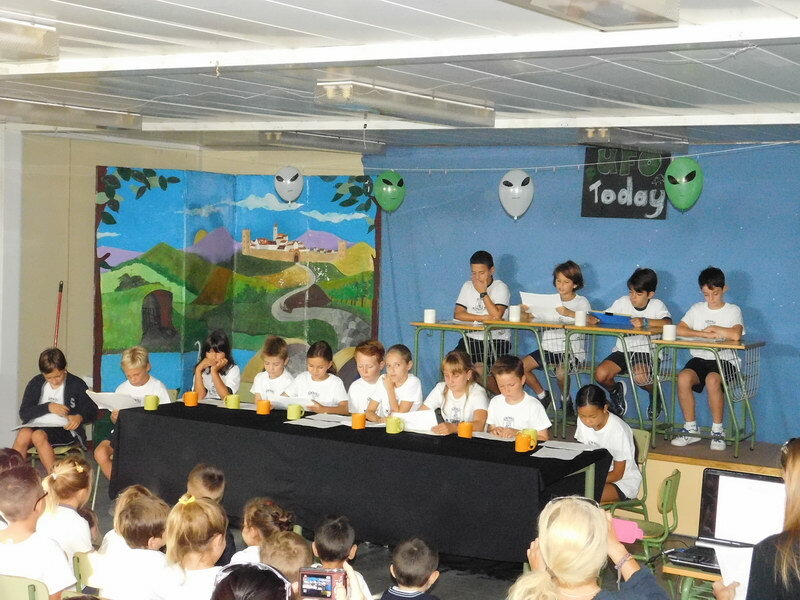 ¡Enhorabuena Upper Primary! 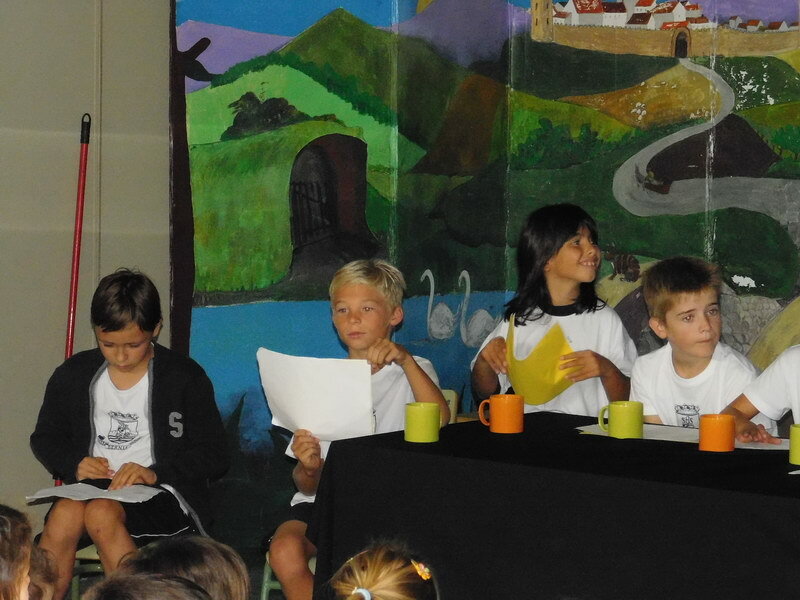 Miss Tex’s class used their assembly this week to discuss the ‘rumour’ that all French people are arrogant! The children used hilarious sketches to illustrate examples of arrogance, before putting a fabulous fashion show, to demonstrate the sheer style of the French people. Of course, Miss Tex’s assemblies would not be complete without an update of Hugo’s and Lucy’s romance, especially with Valentine’s day drawing near. By the end of the assembly, everyone was convinced that France is full fantastic people and ready to jump on a plane straight to Paris. C’est magnifique!